← RECOMMENDED: a movie! The documentary “Blood into Wine,” 2010. 99 minutes. There is nothing “petite” about Petite Sirah except the size of the grapes. (For more information about this varietal, please visit http://www.thefrugalwinesnob.com/?p=481). We’ve reviewed two Petite Sirahs before: the Guenoc 2008 (linked above), and the Mettler 2005 (http://www.thefrugalwinesnob.com/?p=500). We liked them. They were interesting. But they were contradictory in that their bouquets were entirely different from their tastes. The Mettler had an oaky, dry, full-bodied nose, yet was sweet and very soft on the palate. The Guenoc was also a contradiction: it smelled sweet, yet was completely un-jammy and highly tannic. We LOVE the Bogle, however. Beyond interesting, its gorgeous, complex, elegant nose matches its gorgeous, complex, elegant flavors; it has a satisfyingly long finish; it is available at the grocery store; and—get this—it’s available for less than $10. Besides being VERY interesting, it’s incredibly delicious, and it doesn’t take much thinking about it to appreciate it immensely. AAAH. This had the expected deep bluish-purple hue, the blueberry/blackberry flavors, and a touch of oak. I found a hint of licorice, Clark perceived fennel (same essence). It was round and luscious, but brilliant at the same time with a pure, bright, jewel-tone character to its taste—nothing browned-down or mixed or muted or murky about it. I suppose some might mistake this for “simple,” but it isn’t—it is direct and complex all at the same time. And despite the clarity, it also had something earthy and even mushroomy about it. Just incredibly complex and interesting! How can so many styles come from one grape? Once again, the Frugal Wine Snob is amazed. This wine is now on our list of Go-To wines, both for everyday AND for special occasions. WINEMAKER’S NOTES: Thirty-two years after it was first produced by the Bogle family in 1978, Petite Sirah is today considered Bogle’s “heritage” varietal. Once again the trademark qualities shine through in a wine that is the perfect integration of fruit and oak. Full-bodied on the entry, aromas of black plum jam and toasty oak set the stage for what is to come. Vibrant boysenberries and luscious fruit are framed by serious tannins, while wisps of leather and vanilla seduce just enough. A final touch of acidity finishes the wine with a precisely balanced mouthfeel. Try this unique wine with rich meat dishes of lamb, pork or game and their hearty sauces. 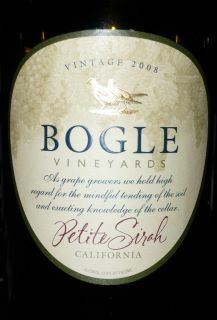 This entry was posted in California, Petite Sirah. Bookmark the permalink.